Let’s consider one type of interaction between atoms called the van der Waals interaction. Our immediate task here is to study oscillations, so we won’t go into the details of how this interaction arises. Let the center of one atom be at the origin and let the center of the other atom be a distance r away (Fig. 14.20a); the equilibrium distance between centers is r = R0. Experiment shows that the van der Waals interaction can be described by the potential-energy function. This is just Hooke’s law, with force constant k = 72U0/R0 2. (Note that k has the correct units, J/m2 or N/m.) 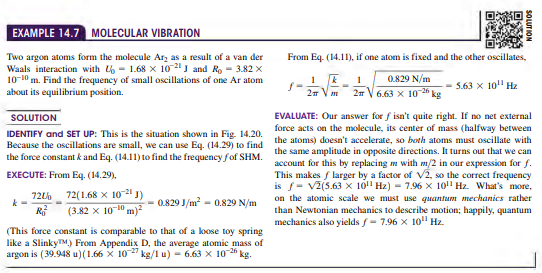 So oscillations of molecules bound by the van der Waals interaction can be simple harmonic motion, provided that the amplitude is small in comparison to R0 so that the approximation | x/R0 | <<1 used in the derivation of Eq. (14.29) is valid. You can also use the binomial theorem to show that the potential energy U in Eq. (14.25) can be written as U ≈ 1 2 kx2 + C, where C = -U0 and k is again equal to 72U0/R0 2 . Adding a constant to the potential-energy function has no effect on the physics, so the system of two atoms is fundamentally no different from a mass attached to a horizontal spring for which U = 1/2 kx2 .